Driving in the countryside in our Amish and Old Order Mennonite neighborhood, we see how many of the common sights inspire the old Amish Quilt Patterns. From the patchwork of harvested fields with the varying colors of green and gold, to the blossoming borders of color surrounding the paths and home. Color and beauty is everywhere. 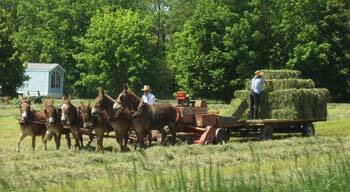 Rows of hay that is freshly cut bring to mind the soft trails of quilting that is on a wholecloth and Amish quilt. It is an amazing sight to see the horse drawn tractor with six hard working mules, and sometimes we see four or six majestic and huge Belgian horses pulling the wagon. Men stack the bales of hay as it comes out of the baler, which brings the Nine Patch Quilt to mind. On other fields we see children running behind horse drawn corn harvester as it's going through the field, laughing and having a friendly competition with their brothers and sisters while gleaning the few corn ears that have been missed by the harvest wagon. Men work together, and neighbors help neighbors building the feeling of community and feeling of value, being an important part of life as they labor. Families gather and work hard during the last days of summer, eager to gather what God has provided in the fields.